Emerald Australia inland from the Capricorn Coast. It is a sizeable country town in the middle of cotton fields. There are a few things to see and a wide range of facilities. Along the main street through the town is the old Railway Station - the most famous historical landmark and one of the very few such buildings that have survived the four large fires that have ravaged the town during the 1900s. 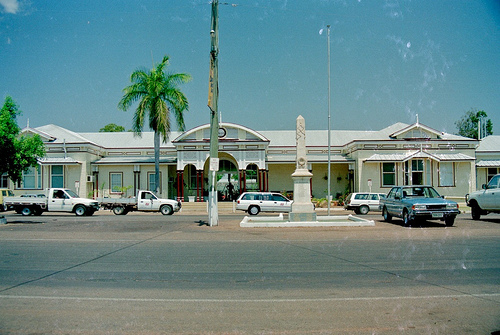 Almost across the road is the town's central visitor information centre, and north of that is the CBD and the Town Hall with a piece of fossilised wood (found during the building of a railway bridge) in front of it. 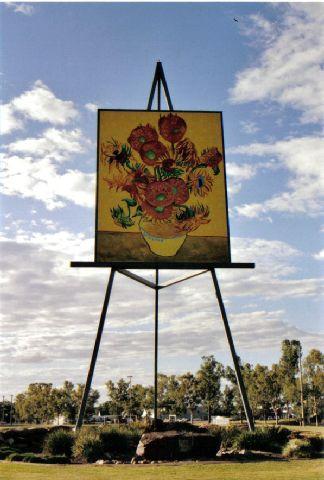 West of the CBD is Morton Park, with the 'Big Easel' and a huge replica of Vincent Van Gogh's painting Sunflowers. In the southern end of the park is Pioneer Cottages - a small historical village with a museum, a church and an old lockup. 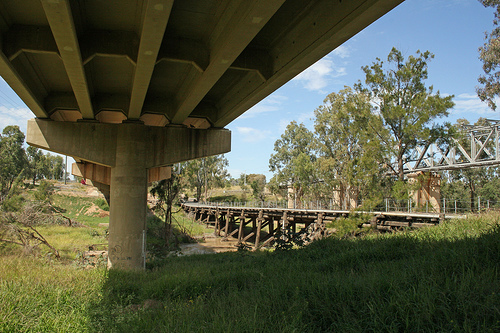 South-east of the CBD is the town's huge Botanical Gardens - an absolute surprise - they are some of the best in Australia, with many different vegetation zones, some excellent historical displays and plenty of great walking tracks. Outside the town is Fairbairn Dam and the man made Lake Maraboon - popular with water sports, fishing and picnics with views. There is also a caravan park out there. Another place to fish is the Bottom Weir in the town. And of course, there are caravan parks, hotels and motels in town. These include A & A Lodge Motel, Emerald Inn, Emerald Meteor Motel, Star Hotel and Emerald Maraboon Motor Inn.